At the invitation of His Majesty the King, the President of the Republic of Singapore, Her Excellency Madam Halimah Yacob, will pay a state visit to the Netherlands on 21 and 22 November 2018. She will be accompanied by her husband, Mr Mohamed Abdullah Alhabshee. This state visit is an affirmation of the close ties between the Netherlands and Singapore. It will also be an excellent opportunity to broaden and deepen bilateral cooperation, especially in the realm of commerce and innovation. Singapore is one of the Netherlands’ major partners in the Asian region, and over 1,600 Dutch companies are established there. Singapore works closely with a range of Dutch enterprises, including Brainport Eindhoven and the Port of Rotterdam, notably on sustainable technology and water-related infrastructure. President Halimah will be accompanied by Mr Masagos Zulkifli, the Minister for the Environment and Water Resources, and by other members of Singapore’s government and business community. Various ministers in the Dutch government will also attend parts of the programme. 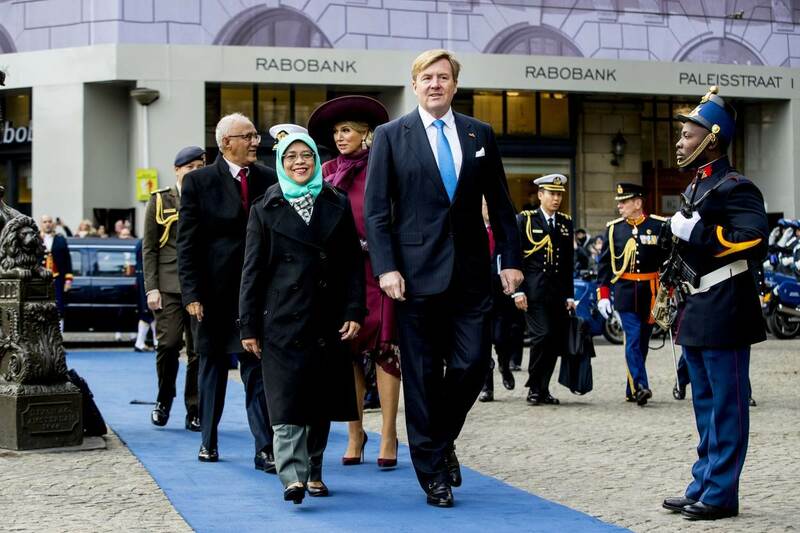 King Willem-Alexander and Queen Máxima will officially welcome President Halimah and her husband on Dam Square in Amsterdam. After the inspection of the guard of honour, a reception will take place in the Royal Palace in Amsterdam with Dutch authorities and the Singaporean dignitaries taking part in the visit. After the reception President Halimah will lay a wreath at the National Monument on Dam Square. In the afternoon, she will join King Willem-Alexander on a visit to Prodock, an innovation hub for start-up companies which was founded in 2016 to stimulate and facilitate innovation in the port of Amsterdam. The capital’s mayor, Femke Halsema, and the Dutch Minister for Foreign Trade and Development Cooperation, Sigrid Kaag, will briefly outline the challenges cities face in aspiring to become ‘smart cities’ with a circular economy. Scientists working at the Amsterdam Institute for Advanced Metropolitan Solutions, Waternet and other organisations will then join start-up entrepreneurs in presenting their solutions to these challenges, such as 3D printing using recycled plastic waste, which is then turned into street furniture. In addition, the Netherlands and Singapore will sign an agreement on cooperation in the areas of water management and the environment. The visit’s first day will end with a state banquet in the Royal Palace in Amsterdam. The second day of the state visit will begin with a visit by President Halimah and Queen Máxima to the Greenhouse Horticulture & Flower Bulbs business unit in Bleiswijk, a demonstration and research centre of Wageningen University & Research (WUR). The programme will include a focus on sustainable farming (including urban farming), innovative horticulture, healthy food and food safety. In addition, Nanyang Technological University and WUR will sign a new collaborative agreement. Afterwards, President Halimah will meet with the presidents of the House of Representatives and Senate. In the afternoon, President Halimah will be the guest of the mayor of Rotterdam, Ahmed Aboutaleb, during lunch on board the vessel De Nieuwe Maze. During their boat trip, they will discuss developments in the port of Rotterdam and the strategy of the current national programme for the Rotterdam-Zuid area. This seeks to boost social inclusion in this part of the city by forging links between groups of residents and improving the quality of work, housing, security and leisure facilities. In this connection, there will also be a visit to the technology department of Hogeschool Rotterdam at the RDM Campus. At this higher education institution, businesses, students and academics work jointly on technological projects fostering smart solutions in the port of Rotterdam. The visitors will meet young people involved in the Rotterdam-Zuid programme, which guarantees employment after they have completed their training. President Halimah and the King will then speak with various start-up entrepreneurs active in the areas of maritime logistics and the circular economy, after which they will attend a business forum. At the latter event a number of partnership agreements will be signed, focusing on enhancing trade opportunities and the exchange of information. From the business forum, the visitors will move on to Delft, where they will be hosted by Deltares, an independent institute for applied research in the field of water and the subsurface. The Netherlands, Singapore and their outlying islands are currently facing challenges posed by climate change and rising sea levels. At Deltares, the President and the King will be informed of the latest research and developments in this field. In the evening, President Halimah will join Prime Minister Mark Rutte for a government dinner in the Trêves Hall at the Binnenhof, during which they will discuss the main topics of the state visit: education and innovation, social inclusion, the circular economy and water. After dinner the King and Queen will take official leave of the President and her husband. On Friday 23 November President Halimah will visit Brainport Eindhoven, accompanied by the Singaporean business delegation. She will be welcomed by Wim van de Donk, the King’s Commissioner in the province of North Brabant. The visit will include a focus on the Dutch ‘triple helix’ approach, in which business, academia and government develop joint products and services. The President will attend a round table discussion on talent and visit a mini-exhibition by businesses working in the fields of health, mobility and sustainability.